When we arrived in the lovely fishing village Brixham, on the south coast of Devon on a Saturday night, we walked down to the port and EVERYONE was sitting out eating their takeaway fish and chips. OK, I might be exaggerating a bit, but there were queues out the door at the numerous fish and chip shops and every seat in those shops and around the port was taken with people tucking into fish and chips. 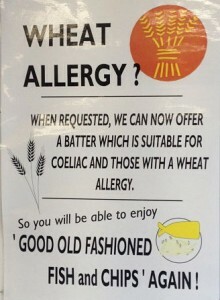 This can be depressing for a coeliac, but I had done a little bit of research before arriving and knew there was one fish and chip shop that could cater gluten free. 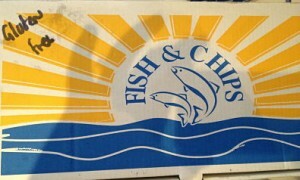 Although it is not by the harbour, I did get to eat fish and chips on day one! This was from David’s Fish and Chips on Bolton Street, about a 10 minute walk from the harbour. 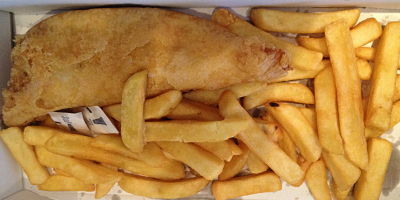 They have a separate area to prepare the gluten free fish and chips, and frozen chips are used for the gluten free to reduce the risk of cross contamination. The fish and batter was lovely (my husband confirmed also good for ‘normal’ people) and the chips were also very good – I would not have known they were frozen if it had not been mentioned in the brochure. They recommend ringing ahead as it can take longer to organise the gluten free option, but we only had to wait 10 minutes on Saturday night. We went back again mid week and the wait was 20 minutes (without advance notice). This is a takeaway only store. Nov 2016 update – they have been shortlisted for the Free From Eating Out awards & good luck for the final awards! 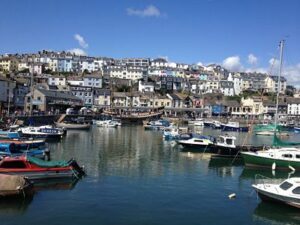 For information on other eateries around Brixham and Torquay, click here. Gluten free available 7 days a week.